People garden for vegetables, herbs and fruits. Why not condiments? This past spring I was surprised to find a horseradish plant at my local garden center. They only had one, but I grabbed it. Horseradish is a perennial in zones 2 through 9. In fact, it’s so hearty than the underground roots can become invasive. Since my horseradish was only planted in the spring, I was frugal in digging up just a few roots this fall. They didn’t smell of much until I processed them. 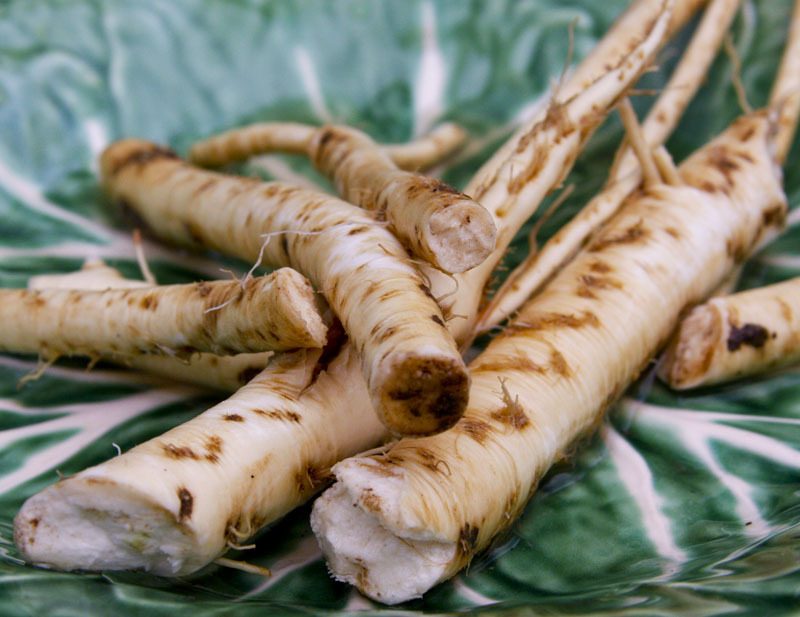 Processing horseradish in large quantities should be done outside to avoid burning of the eyes and nasal passages. It involves peeling and then grating the roots by hand or in a food processor, adding a vinegar and water mixture to preserve the horseradish. Fresh horseradish processed this way will keep for about six weeks in the refrigerator. Since I only had a bit of horseradish, I threw caution to the wind and processed it indoors rather than hauling my Cuisinart to the back porch. I survived unscathed. The fresh horseradish is amazingly brisk and pungent, with a much cleaner aroma than the horseradish I buy in the stores. So far I have made a sauce for crab cakes and horseradish deviled eggs—because God knows I have plenty of eggs. The flavor is so fabulous, I’ll never be without horseradish in my garden again. I suppose that’s especially true if it turns out to be invasive. A couple of months ago a member of my local foods group told us that she was buying garlic at a local farm stand when she thought to ask where the garlic was from. “China,” was the farm stand worker’s response. China? Chinese garlic at my local farm stand? It turns out that two-thirds of the world’s garlic is produced in China. Frankly, given the toxic products I’ve been reading about from China—baby formula, dog food, dry wall—I think it’s a good idea to know where my products are coming from and avoid problems where I can. That wasn’t my motivation for growing garlic, but it’s as good as any to add to what I already have growing this year—so I don’t have to buy Chinese garlic, especially garlic masquerading as local foods at my local farm stand. 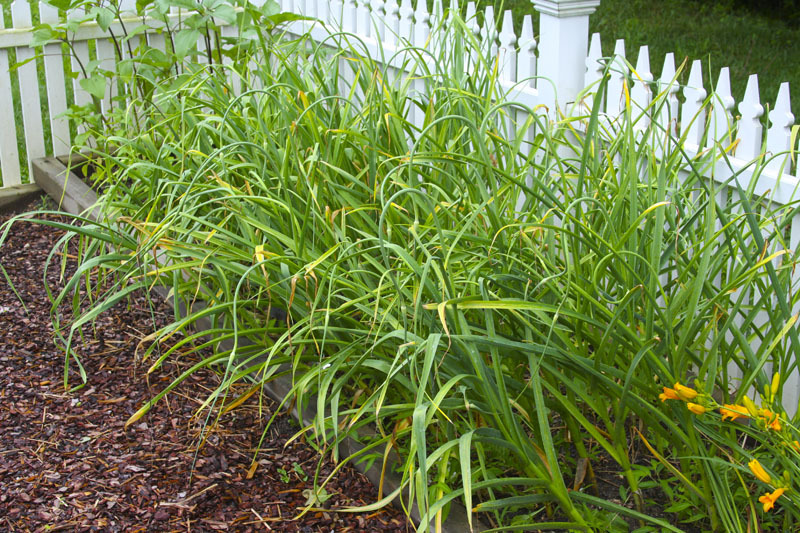 Last fall I planted six varieties of garlic on October 26. I know the date because I noted it in my Lee Valley 10-Year Garden Journal. I planted Kettle River Giant, German White, Chesnok Red, Transylvanian, Music Pink and Applegate. When I harvested the garlic the German White was the largest and, it turns out, the most flavorful in our salads. The Chesnok Red and Music Pink were the most puny and some were a bit bitter. I have put aside more of the German White to go into the ground after reading about where most of our garlic comes from. The garlic in May starts to turn yellowish. 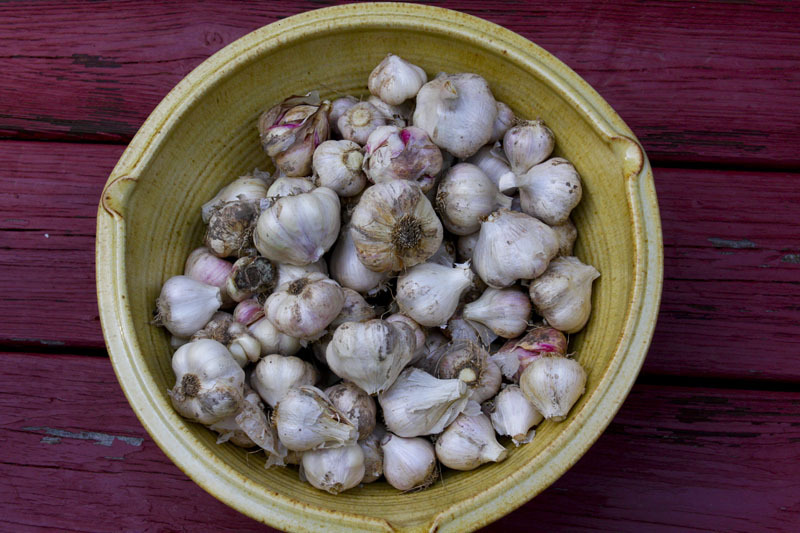 Garlic is harvestested when about two-thirds of the tops have died back. I haven’t read about there being any problems with Chinese garlic. But I’ve read about enough problems with our food supply that I’m convinced the more food I can raise right here at Bumblebee, where I am the caretaker and I take care, the better off my family and I are. It’s a matter of health, but it’s also a matter of principle. It turns out it tastes pretty good too.